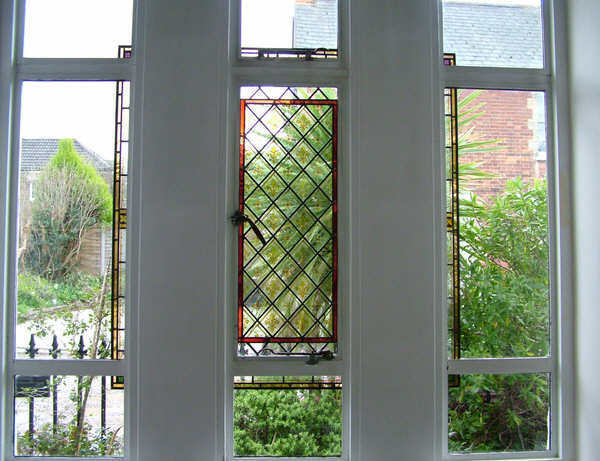 This project shows how we can reuse and adapt your own stained glass windows to create a beautiful stained glass solution anywhere in your home. The client was very keen to have some stained glass within the windows of their living room and had the painted diamond quarry panel just resting up against the centre window. We needed to partially obscure the view onto the street but make the most of the sunlight which streams into the room in the morning. 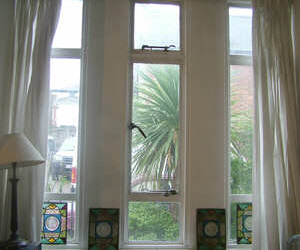 The customer also requested that the stained glass extend into the outer panes of the window to create a picture frame but without loosing any of the stained glass behind the curtains. With the addition of a few pieces of other original stained glass for the corners and borders I created this scheme to fulfil their brief. 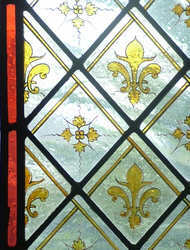 The border glass from the original window was used in the outer lights with the addition of floral painted corners. As the curtains cover the outer edges of the window the client felt this was a very good solution. 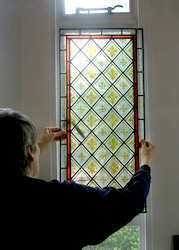 The border glass from the original window was used in the outer lights with the addition of floral painted corners. As the curtains cover the outer edges of the window the client felt this was a very good solution. Error: Error validating access token: Session has expired on Monday, 08-Apr-19 03:56:55 PDT. The current time is Friday, 19-Apr-19 11:57:39 PDT.